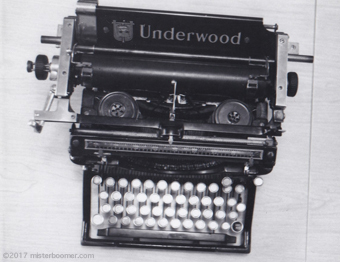 That shot of the Underwood typewriter brings back memories…not of my youth, but of “House of Cards”! Frank Underwood types a letter on an Underwood typewriter, explaining that no, his familydidn’t own the company, just that typewriter! I took typing in High School and I was so slow and inaccurate that I received a “D”. I note that I only received three D’s in my academic career — a History class in the 7th grade, the aforementioned typing D and a D+ in a law property class. Undaunted, I majored in History in undergrad and for years I practiced real estate law using a computer. Which made me think, what the heck did I get all those As, Bs and Cs for anyway? !